I used to plane the edges of the wood strips I cut using a hand plane, but I've got a new benchtop power jointer and wanted to use it as it would be much easier and accurate. I am in the process of creating some cutting boards and wanted to use the small jointer I have to straighten up the edges of the strips I cut. I dont think it will be an issue doing it for the first set of cuts as I can plan with the grain. 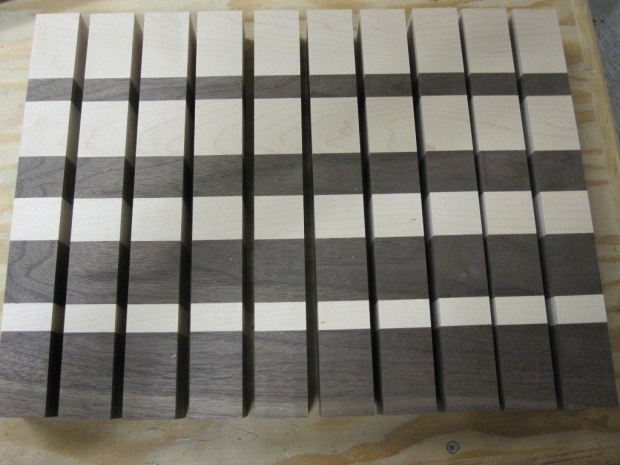 Would the edge jointing go smooth across the grain, which is the resulting strips after the second set of cuts, like the ones in the below pic? I used to do the same with the hand plane and didn't have issues there. Would you use a jointer on end grain? Would the edge jointing go smooth across the grain, which is the resulting strips after the second set of cuts? I used to do the same with the hand plane and didn't have issues there. This depends on the depth of cut you take with the jointer. If you take a pretty shallow cut (1/32" is probably about right) and have very sharp jointer blades, the finish should be ok cutting cross-grain. However, you will still likely get some blowout on the back end of the piece (the last part to be fed through the jointer). This is because the jointer knives will want to spilt the cross grain off the corner. This can be alleviated by chamfering that corner before planing. I would avoid it. As @rob said, it's very dangerous, and the risk-vs.-reward is not in your favor. Just imagine the knives splitting off the chunk your hand was using to feed the piece through, and then there being nothing between your hand and that rapidly-rotating, very sharp set of blades. Even if you're using push blocks, the push blocks could catch in the blades and be flung across the shop (if you're lucky) or flung into your face/gut/crotch (if you're less lucky). I have found success using a very sharp hand plane to level off end grain on cutting boards. The success of this approach is very dependent on your ability to glue up the blank mostly level/flush in the first place so you have less to remove. Again, that's a thickness planer, which has the cutterhead pretty much fully-enclosed and self-feeds once you get it started. But you're talking about a jointer, which leaves nothing but the workpiece between your workpiece and the push pads that you hold with your hands to push the workpiece across the jointer. 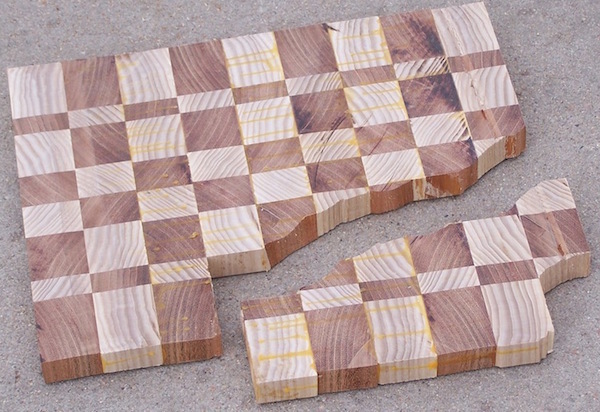 If you're doing this with individual endgrain strips, it seems like those would be even more likely to split. I'm sure you could find ways to limit your risk, for example, by using a power feeder or a heavy-duty jig, but it still doesn't seem like a good idea. I wouldn't want my hands anywhere near the workpiece when something like this would be likely to happen. Trying to joint endgrain on a jointer sounds like a great way to wind up in the emergency room. That said, some people get away with using a thickness planer to take off very shallow bites (e.g., 1/32" or less). If you want to try this it's important to have sharp knives (and preferably a segmented cutterhead with sharp cutters) to help against tearout, and to chamfer (bevel) the edges to help protect against blowout on the trailing edge...but there are still safer and less accident-prone ways of flattening the end grain. You'll probably have better luck with a drum sander or router sled, though it's still important to take light passes. It seems like everyone I know with a drum sander has a dent in the wall from a drum sander "incident." Definitely no. Granted, some species will be more prone to splitting across the end grain than others, but in general it's too dangerous. Don't joint the individual strips. Instead use a high-quality crosscut blade on your table saw when you make the crosscuts, and after you've glued up the board, use a router sled, sander, hand plane, or scraper to further smooth the surface if necessary. Just glue a sidegrain hardwood border around it, run it through your planer (lightly with sharp knives), then cut the border off if you want. There's always an easier way. Not the answer you're looking for? Browse other questions tagged jointer or ask your own question. How can I joint a board that is longer than my jointer infeed table? 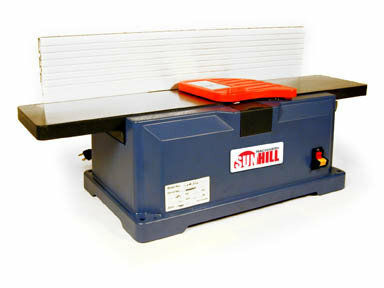 Any tips on reconditioning/using an old benchtop jointer? Should I joint my workpieces first or cut them to rough size first?